“The Trend in School Building Design” » James Betelle, Where Are You? Included are a number of photographs and plans from the original article (there are way too many to show them all). By James O. Betelle, F.A.I.A. 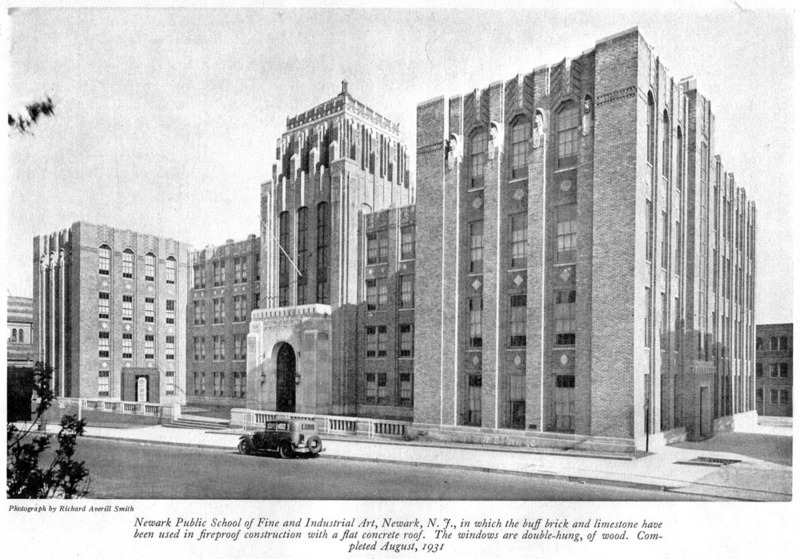 Of the Firm of Guilbert & Betelle, Architects, Newark, N.J.
Prosperous times for the past ten years, together with a greater demand for public education, have brought a great number of school buildings throughout the country. The erection of these buildings has furnished an opportunity, through experience, for the educated and architects to improve them, not only in design and construction, but also in layout, thereby making them more suitable and usable as educational structures. The present business depression and reduced municipal budgets, in so far as they affect public education, are only temporary. The citizens of our country have continually demanded better and better educational facilities for their children, and they will continue to do so as long as this country remains a republic. It must also be remembered that the country will continue to increase in school pupils, and existing buildings will become obsolete, so that the demand for new buildings will accumulate as it did during the World War, when new school construction as temporality stopped. When better times come there will be an increase in building costs, so that now is the time to build, when the dollar will buy the maximum in both labor and building materials. It is often asked: “Why is it that our present school buildings cost so much more than they used to?” Of course, one large item is the increased cost of labor and materials, though this is a matter which is correcting itself in a measure, due to the business depression. There are many other items, however, that have increased the expense of the present-day building over the school of generations ago, due to the fact that there is an insistent demand for better housing conditions and also more complete educational facilities than those that we were satisfied with in years past. To-day there is a demand for the use of special plaster on the walls and ceilings in noisy rooms and the use of some quiet floor material in order eliminate noise. There is a demand for more elaborate electrical equipment and lighting throughout the building,m the installation of radio receiving systems and for moving pictures with sound equipment. larger auditoriums are installed, together with large gymnasiums with space for many spectators, and swimming-pools with their adjoining shower and locker rooms, more miscellaneous rooms for administrative and health work, lunch-room and kitchen and rooms for extra-curricular activities. These and many similar items of improvement and refinement were not considered necessary, nor where they known about, a generation ago, There is no argument about the desirability, nor the educational value, of these carious items, but they are simply mentioned to answer the persistent inquiry as to why there has been an increase in the cost os school buildings. Another factor which places a mandatory increase on school-building costs is the multiplicity of school-building laws enacted but the various States. No amount of rules and regulations will make an incompetent architect design a good school building. On the other hand, these rules and regulations in such minute detail handicap the good architect and prevent him in many cases from exercising his skill and ingenuity in producing some new an worthwhile improvement in school design. The state school-building laws throughout the country are in great need of standardization, with variations to suit local conditions, as they now extend from nothing at all in some States to a code going into great detail in others, and also coming under the control of several state departments, The school-building inspectors ofd the various States have formed an association, and the standardization of state school-building codes is one of their objectives; they will no doubt bring order out of chaos in the next few years. The consolidation of rural schools, while not altogether a modern trend, since it has been going on for some years, has been stimulated by the improved concrete highways and the safe and efficient motorbus transportation, which permits more readily than ever before the elimination of small rural schools and the consolidating of a number of them into one large unit. There are still thousand upon thousands of small, one-room schools existing throughout the country, but no more are being erected and many are being eliminated by consolidation each year. By consolidating the elementary and high schools into larger units, a better quality of instruction and a lower cost per pupil are made possible. In rural schools it has always been necessary to make some provision for the children to eat their noonday lunches. In times past the children simply brought a cold package lunch and ate it in their schoolrooms. It is now conceded by every one that for the health of the children something better than a cold lunch hastily swallowed should be provided, both in the rural and in the city schools, which means some sort of hot dishes and a abetter place in which to eat, To do this some kind of kitchen must be provided, and in the larger schools a cafeteria lunch-room as well. A considerable amount of room is occupied by a cafeteria lunch-room, and the modern tendency is not to leave this space idle and unoccupied except for possibly an hour or two at noon, but to make it serve some useful purpose all the time. As the modern school has a minimum amount of basement and is built above the ground rather than in the ground, the cafeteria is as well lighted as any classroom. By closing off the kitchen and cafeteria counter, and with the use of folding doors, the large area of the cafeteria can be divided into spaces suitable for any school purpose where flat-topped tables and chairs make appropriate furniture, such as a study-room, ordinary recitation-room, etc. Another modern trend which is noticeable is a reduction in the size of school auditoriums and their more intensive use. Until recent years, it was felt necessary that the auditorium be large enough to seat practically the entire school at one time. This made it a very large, expensive, and unwieldily room, and as a result it was used very little of the time, which represented a considerable waste of capital expenditure. It is now realized that to justify the expense of an auditorium it must be in constant use. For strictly school purposes, an auditorium seating about two hundred and fifty is large enough for a large elementary school, and one not larger than a third of the pupil capacity is big enough for a junior high school. In a high school the size of the auditorium depends upon how important it becomes form a community and civic standpoint. A town needs one large auditorium for civic meetings of all kinds, but even then the trend is toward reduction in size. There is also a trend toward reduction in the amount of blackboard space provided in the classrooms, and a corresponding increase in the amount of corkboards provided for pinning up pupil’s work or other exhibits. Modern teaching methods no longer send large groups of children to the blackboard at one time, so that there is now a tendency to provide blackboards only across the front of the room in back of the teacher’s desk. The side and rear walls, where space is available, are covered with corkboard in a frame similar to the blackboards. There is a new technique being evolved in modern education of which the architect must take note. Classroom instruction is becoming more informal, movable furniture is being used, and much more storage space is being made available in each classroom. This storage space takes the form of cupboards, drawers, etc., set flush with the walls, where possible, wherein the illustrative material, extra text-books, supplies, etc., are kept. There is also provided a series of cupboard or drawers where each individual pupil make keep his own working materials and books, In many classrooms a sink or wash basin is also provided, There is also a tendency to increase the area of the classroom slightly, or to reduce the number of pupils in each class, as the new educational methods need more space to carry out their projects than was needed in the older and more formal type of instruction, where fixed seats in rows were used. The type of education to be carried out in the building determines its layout, and the architect, to remember the best services to his client, must be familiar with educational matters, as well as with architecture and building. European school buildings have very little to offer us, so far as new ideas are concerned. Very few schools have been erected in Europe since the war, so that America has the best school buildings in the world to-day. Europe must come to us for new ideas in schools as she has had to do in other lines. The one important thing Europe has contributed is the so-called “Modernist” style of architecture used in the treatment of the exterior. There is a distinct trend in America to break away from the traditional structural forms. There is merit in this tendency and it is to be encouraged so long as it is not carried to extremes, of which there is no evidence as yet. An educational survey by competent authorities, with definite recommendations as to the number, size, type, and location of the buildings, giving thought to the future development of the community, is always time and money well spent. The adoption by the boards of education of a building programme, along the lines recommended in the educational survey covering a period of years, permits the purchasing ahead of time of sites for school buildings, thereby saving thousands of dollars to the taxpayers. Consultation with architects as to the cost of a school building containing the educational accommodations recommended by the superintendent of schools before an appropriation to erect the building is asked. The use of simple and substantial materials and the avoiding of imitations and substitutes which do not have the wearing qualities of the materials imitated. Economy practiced in its various forms, such as economy in plan or layout, economy in materials, and, last but not least, economy in the use of the building. Each of these types of economy must be used with discretion and judgement, otherwise they come mere forms of extravagance. The most modern of educational facilities in our schools to-day are the radio and the sound picture, and it will not be long before television will also be available. All of these facilities bring the outside world into the classroom and are suitable for group instruction in certain subjects. Radio instruction by television will mean an adjustment in the plan of our schools to accommodate the larger groups, and just what these adjustments will be no one can foresee at this time, There will undoubtedly be a central sending station in one of our large cities, possibly in connection with a great university, where the finest instruction talent is available, which will broadcast lessons to pupil groups assembled in various parts of the country. These lessons will be amplified and explained by the classroom teachers in charge of each group. One of the healthiest signs of the modern trend is the fact that superintendents of schools are taking courses of lectures at our higher institutions of learning dealing with the school-building plant, and architects are studying educational methods and routine. This will not make architects out of school superintendents, or educators out of architects, but it will bring about a better teamwork and a better understanding of each other’s problems. It will also enable them to speak and understand a common language, and, by working for a common end, bring about better designed, more economical and usable school buildings, which above everything else, is the trend of to-day.